A former Heathrow worker, who called herself the "lyrical terrorist" because of the extremist poems she wrote, has won an appeal against her conviction. Samina Malik, 24, from west London, was found guilty in November of collecting information likely to be useful to those preparing for a terrorism act. The Court of Appeal has now quashed the conviction after prosecution lawyers conceded it was unsafe. Appeal judges said the jury may have been confused by some trial documents. Ms Malik, who was not in court, was given a nine-month prison sentence suspended for 18 months in December last year. She became the first woman to be convicted under Section 58 of the Terrorism Act 2000. The Lord Chief Justice, Lord Phillips, was sitting in the Court of Appeal with Mr Justice Goldring and Mr Justice Plender. Giving judgement, Lord Phillips said: "We consider that there is a very real danger that the jury became confused and that the prosecution have rightly conceded that this conviction is unsafe." He went on to explain how in February this year, the Court of Appeal had studied Section 58 of the Terrorism Act in detail. It had concluded that an offence would be committed under the act only if a document was of a kind likely to provide practical assistance to a person committing or preparing an act of terrorism. Propagandist or theological material did not fall within Section 58, Lord Phillips said. In Ms Malik's case, some of the documents used as evidence were therefore ruled not to fall within the section. Lord Phillips added: "The jury was required to consider not only documents which were capable of being of practical utility for a person committing or preparing an act of terrorism, but a large number of documents that were not. "We consider that there was scope for the jury to have become confused." Following the judgement, the Crown Prosecution Service (CPS) said it would not be seeking a retrial. Sue Hemming, head of the CPS's counter terrorism division, said 21 documents the prosecution relied on in Ms Malik's trial "would no longer be held capable of giving practical assistance to terrorists". "However, other documents in her possession, including the al-Qaeda Manual, the Terrorist's Handbook, the Mujahideen Poisons Handbook and several military manuals, clearly retain that potential. "We therefore have no doubt that it was right to bring this prosecution." But taking into account the time Ms Malik had spent on remand before her first trial and the likely non-custodial sentence she would receive upon conviction in a retrial meant the CPS had decided not to take the case to court again, she said. "Ms Malik was not prosecuted for her poetry. She was prosecuted for possessing documents that could provide practical assistance to terrorists," she added. Ms Malik posted extremist poems on websites under the screen name "the Lyrical Terrorist", but has always insisted they were "meaningless". 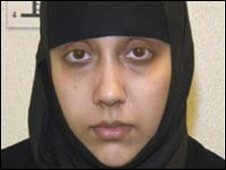 At her trial she was found not guilty of a more serious charge, under Section 57 of the Terrorism Act, of possessing an article for a terrorist purpose. She denied the charge.